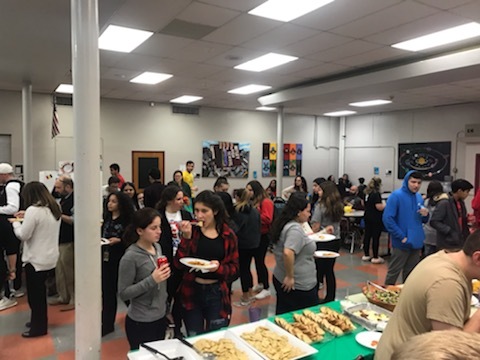 On February 7th, Nutley High School held its annual Night of Nations. This is a fundraising event where students and faculty choose a nation and make food to represent that culture. The community then gathers and eats the food from all around the world, celebrating various ethnicities. This event began in 2015. It started out small, but has been slowly growing over the years. Natalia Acevedo, the senior class vice president, along with Ms Melissa Brady, student council advisor, organized the event that took place in the cafeteria that evening. “The event started my freshman year and not to many people came. The next year, we invited more clubs and people so more people showed up. From there, the event just continued to grow,” says Acevedo. This year, 40 guests attended the free event. To get the event set up, Ms. Brady sent out a survey to all the participating clubs to choose a nation that they would be representing. Once they choose what nation they wanted, they were responsible to cook the food prior or the day off the event. Each group got a table or section to decorate with flags or others materials to make their nation stand out and gain attention. It was a great event full of positive vibes and it was an enjoyable night just gather around friends and enjoy a lot of different ethnic foods.